EDWinXP is an EDA Software Package for automated design of electronic products. This integrated tool covers all stages of electronic design process - Schematic Capture, Simulation, PCB Layout Design, Generation of PCB Manufacturing and Testing. Complete design information is stored in the integrated project simultaneously accessible by Schematic Diagram Editor, PCB Layout Editor, Fabrication Output Manager and Simulators. This simulator provides EDWinXP users with the facility to analyze and validate the functionality and behaviour of circuits captured in the form of schematic diagrams. The EDSpice simulator is based on SPICE3F5 and XSPICE with a number of extensions and improvements. Front and back annotation of all design changes is fully automatic. EDWinXP comes with an extensive part library, which may be updated, customized and enhanced with the help of th the help of Library Editor. All data about hierarchical electronic design (which may consist of several circuits and sub-circuits) is stored in a single database, along with PCB layouts for every board in the design, i.e. the software works on the concept of integrated project database. In other words, the documentation of a complete electronic device may be stored in one disk file. All parts of the design project – schematics, PCB layout and PCB fabrication drawings and documents are simultaneously accessible by task oriented software modules of the system. 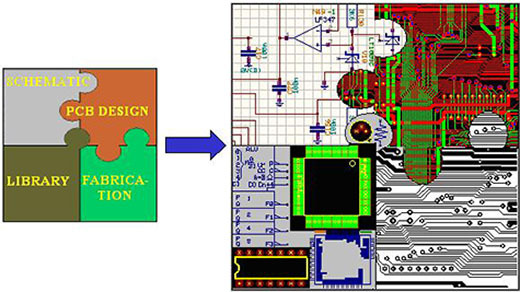 Changes in the design, entered on diagrams are automatically and in real time annotated on PCB layout design and vice versa. The current version, EDWinXP 1.90 unveils a countless set of features, comprising of Schematic Editor, Simulators – Mixed Mode Simulator and SPICE Based Simulator EDSpice, PCB Layout Editor – Create the PCB Layout, Fabrication Manager – generate Manufacturing output files for Photoplotter, NC Drill etc, Thermal Analyzer – check for hotspots on the board, Electromagnetic Analyzer (with Signal Integrity and Field analyzer) – check for electromagnetic effects on the board. 3D Viewers and Editors, VHDL Editor with facility of automatic project creation from VHDL source and Converters (CUPL, JEDEC, XILINX), Microcontroller Simulation using 8051,AVR,PIC,Motorola Microcontrollers, 3D Library Editor, Model Generators from VHDL for Mixed Mode and EDSpice Simulators with facility of automatic creation of model/ library along with other features. Apart from the major attraction, completely integrated design concept with Automatic Front and Back Annotation and 28,000 + Library Components and Library Editor for library component creation. EDWinXP supports Reverse Engineering – complete reconstruction of project database using full set of artworks in Gerber ASCII format or complicated PCB Outline. Other modules are VHDL/Truth Table to diagram converter, 3D IDF file viewer, Filter Designer, ODB++ Export and Import and much more.. The current version, EDWinXP 1.90 unveils a countless set of features with more flexible and enhanced editors, PCB Wizard,Enhanced 3D Viewer and Improved 3D IDF Viewer using Open GL and a new set of Libraries. The Editors comprise of Schematic Editor, Simulators – Mixed Mode Simulator and SPICE based simulator EDSpice, PCB Layout Editor – Create the PCB Layout, Fabrication Manager – generate Manufacturing output files for Photoplotter, NC Drill etc, Thermal Analyzer – check for hotspots on the board, Electromagnetic Analyzer (with Signal Integrity and Field analyzer) – check for electromagnetic effects on the board. 3D Viewers and Editors, VHDL Editor with facility of automatic project creation from VHDL source and Converters (CUPL, JEDEC, XILINX), Microcontroller Simulation using 8051,AVR,PIC,Motorola Microcontrollers, 3D Library Editor, Model Generators from VHDL for Mixed Mode and EDSpice Simulators with facility of automatic creation of model/ library along with other features. Apart from the major attraction, completely integrated design concept with Automatic Front and Back Annotation and 28,000 + Library Components and Library Editor for library component creation. EDWinXP supports Reverse Engineering – complete reconstruction of project database using full set of artworks in Gerber ASCII format or complicated PCB Outline. Other modules are VHDL/Truth Table to diagram converter, 3D IDF file viewer, Filter Designer, ODB++ export and import and much more..